Ti’un is an exception. I mean, they’re all exceptions at this point, right? Ti’un The Wanderer is an Aquatic Beast of Fable in Book 3 of the Beasts of Fable Daily quests. He’s located in the Townlong Steppes, just west of the Gao-Ran Battlefront. Ti’un packs a strong defense, strong offense, and his one terribly, awfully unique thing among Beasts of Fable: an AOE. Our first step to deal with AOE is usually to break out our Sandstorm pets, but not so fast. Ti’un has the ability Shell Shield, which adds an extra amount of flat damage we’ll have to burst through to even make a scratch. Add a Sandstorm, and we won’t be able to get anything at all past him. His other main offense is Pump, which does a ridiculous amount of damage after being activated, then re-activated for a big hit. He, like Nitun way back in Book One, uses a variable moveset, so he could conceivably just murder all your pets in 4 turns a pop, or he may kill all 3 at once with his AoE. Very, very tricky. This particular strategy hasn’t failed me yet, though. Yeah, I know, the Raven again. The Nocturnal Strike combo is so deadly it’s really hard to pass up in general, but especially here, because it’s one of very few abilities which is a single hit and powerful all on its own, without a ton of synergistic buffing malarkey. Many of the buffs I’d use in this situation require being able to punch through that shell shield in order to activate, and almost none can. A Chrominius or Fox with Howl would help a bit, but because of the shield both bring relatively negligible damage otherwise in this case. I chose the moth for a couple reasons. The first is that moths are generally really readily available at high levels so everyone has a couple kicking around to help fill out a Flying pet-heavy team. The other is to illustrate just how hearty Ti’un is. Alpha Strike is able to push through that shell shield mentioned earlier, but the added damage for being faster is tacked on as an extra hit, making it, well. For this reason, Peck is the preferred move in slot one for all my pets here, including the real star of the show here: the Kaliri. 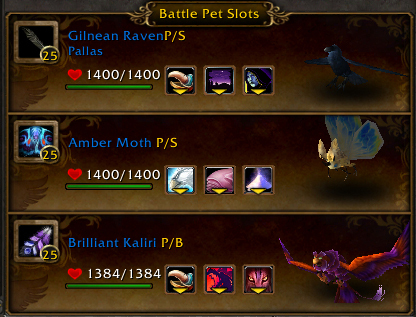 If you can muster up a few Owl-type battle pets like the Kaliri (including Miniwing, the Night Elf vendor pets, etc), that would be fairly ideal. Though their damage-reducing debuff does need to get through the shield, Ti’un is occasionally very lax in applying the shield, and because your birds will almost always be faster as soon as the shield drops you can apply it. The other reason you really want to bring some Owls to the party is Predatory Strike. Predatory Strike is on a relatively long cooldown and deals a good amount of damage to start, but once your opponent is below 25% health, it deals double damage. 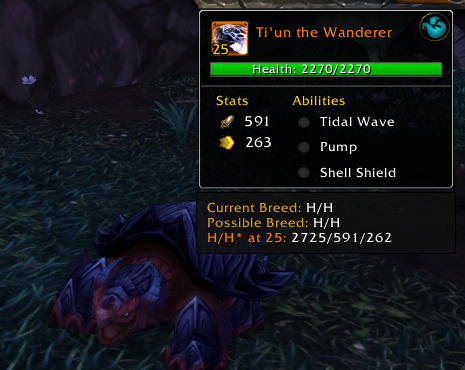 For Ti’un, that magic number is 566 health. Predatory Strike is especially appealing here, because the extra damage is tacked on to the first hit, not split into a separate hit like Alpha Strike. This means that after the first hit punches through the shield, the added damage is entirely applied to your opponent. 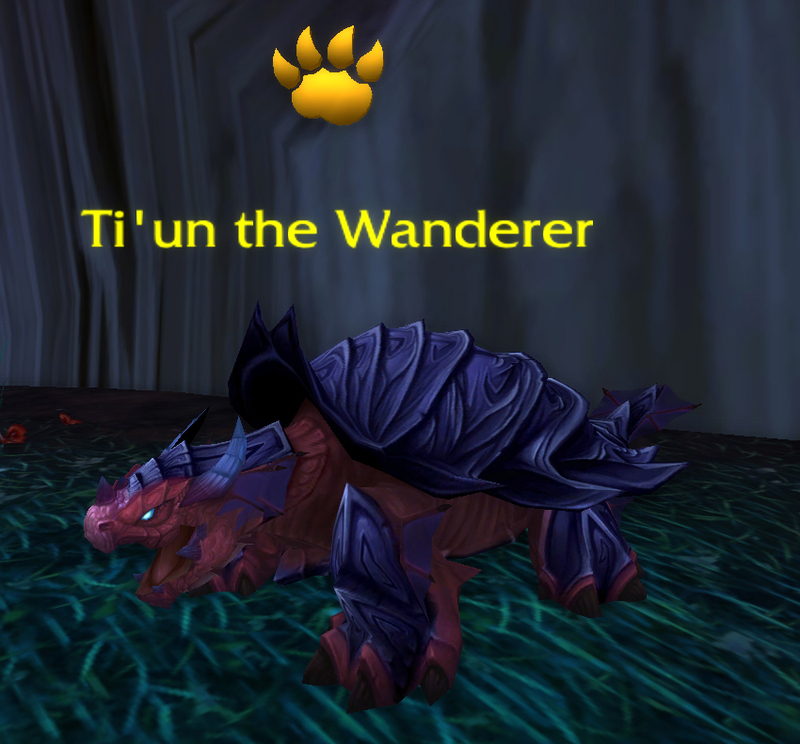 If you can get Ti’un to 25% and have an Owl as your anchor, you pretty much win. This is why I start off the fight with the Gilnean Raven instead of using it as the anchor. I also lead with the Raven because with my speed and the two-turn nature of Ti’un’s Pump, I can 1-2 punch Darkness and Nocturnal Strike for sure at least once before my Raven is toast. 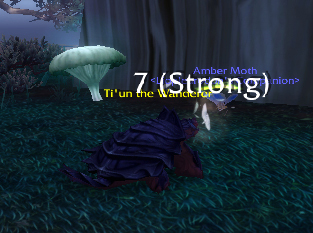 I use the Moth second because I can stall out the rest of Darkness’s hit-lowering Blindness aspect by using Cocoon. I wait for Darkness to run out before trying Moth Dust because of its long cooldown. We don’t want Moth Dust to miss. Stuns are nearly always fantastic for single-pet fights, and even if not it deals a ton of damage. And we definitely want to stall out the rest of Darkness for that Predatory Strike. An alternate strategy I’ve used is a team of just moths. Heck, if I get lucky with the timing of my Cocoon to absorb a Pump or two and hit Moth Dust’s sleep effect I can all but solo him with just one. But that requires a lot of RNG on your side, so I’m not going to recommend it as my A-line strategy here. It’s just nice to note if you’d like to try this guy and have a few moths kicking around. The Howl Bomb strategy works nicely here, too. This entry was posted in Beasts of Fable and tagged beasts of fable, daily on May 2, 2014 by Liopleurodon.